September, 2012 | H&R Group K.K. 100 Yen Stores in Nagoya – Not “cheap,” CHEAP! Back home you might not shop at what we in the US refer to as “dollar stores,” or stores where everything is priced at 1 US dollar, because they are generally associated with poor quality goods, but this is not the case in Japan. 100 yen stores offer a wide variety of goods to solve little problems you never realized you had, and often the items on offer are of very similar quality to those available in much more expensive grocery or hardware stores. These shops specialize in purchasing huge quantities to get big discounts on a wide variety of items such as: table and kitchenware, tools, garden items, stationary, household and leisure goods from China and other countries with low production and labor costs that enable them to price them at what are sometimes below actual market value. You can find 100 yen shops all over Nagoya in sizes that range from multi-story standalone buildings, to small kiosk style corners in malls and supermarkets. One of my favorites is the Daiso on the 7th floor of the Skyle building in Sakae; they seem to have everything! Osu Kannon Temple was moved to its current location by the very late and very great Tokugawa Ieyasu in 1612. The main temple on the site today was reconstructed in 1970. The Flea Market at Osu Kannon is held rain or shine on the 18th and 28th of every month like clockwork. If you are in the area this market offers around 60 stalls on average, and is fun to browse due to the eclectic nature of the wares on offer. You never know what you might find in the mishmash of genuine antiques and complete junk, fine art and kitsch, the truly useful and the totally frivolous. There is one stall that specializes in used kimono that I have heard mentioned a few times, so if you are in the market for one it might be worth a visit. Most dealers are seasoned veterans, so real deals can be hard to find, but a good eye is often rewarded! This market is popular with international visitors looking to score an out-of-the-ordinary souvenir or two, and if you fail, there is always the nearby Osu Shopping Arcade. I personally make a trip out to Osu 3 times a month or so just to drop in. It has a really cool atmosphere. The karage, roasted chicken, and pizza place are all highly recommended. Held on the 18th and 28th of every month, rain or shine. If you are after a nice organic potato, carrot, cabbage, or other fruits and vegetables this might be your best option. Every Saturday morning you can find about 20 tables / stalls setup inside of Oasis 21, in front of the Starbucks that are staffed by farmers and their family members. On the rare occasion you will happen upon a real find here; I saw kale once, and that stuff is impossible to find in Nagoya. Please note I said ONCE! They always offer the standard variety of whatever is in season though, and they are super friendly people! Held every Saturday from 8:30 – 11:30. Nittai-Ji Temple was constructed in 1904 to hold the ashes of the Gauthama Buddha, a gift to Japan from King Chulalongkorn of Thailand. It was named the “Japan-Thai Temple”, to celebrate friendly relations between the two nations. The temple features the 15 meter Gandala-style Taian Pagoda, which houses the relics Japan received. Nittai-Ji Temple hosts a farmer’s market on the 21st day of every month. While not an organic market per se, it is larger than the weekly market held at Oasis 21 and you can get very good deals on a larger variety of seasonal vegetables- especially if you are willing to by larger volumes. I once got a bag of peanuts there that came very close to being enough peanuts for me…close, but no cigar. You can NEVER have enough peanuts in my opinion. 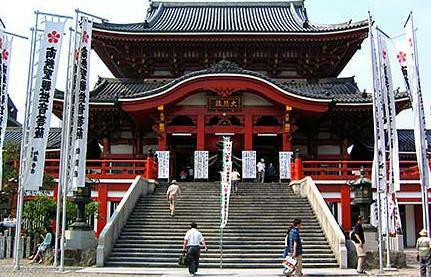 Kōshō-Ji Temple was established by Nagoya’s beloved Tokugawa clan in the 17th century. The temple and grounds, including the graveyard, are situated in the woodlands of Yagoto Hill. The temple complex consists of wooden buildings including a five-story pagoda completed in 1808. The annual “1,000-Lantern Festival” takes place here, and is supposed to be notable, but I could find no specific information about it; anyone been? Kōshō-Ji Temple also holds a monthly farmer’s market on the 21st of every month that is very similar to the one held at Nittai-Ji. Featuring over 3500 booths and 60,000 attendees, the Mammoth Flea Market is largest flea market in Japan. It fills the entire Port Messe building with all kinds of bargains and bargain hunters. This event is held annually, as we mentioned at Port Messe, in late April. Port Messe Nagoya (ポートメッセなごや), near Kinjo-futo Station on the Aonami Line.